The writer Edmund H Sears is best known for penning It came upon the midnight clear. 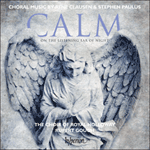 Another Christmas poem, Calm on the listening ear of night again provides Clausen with plenty of nocturnal imagery, and the pastoral scene is further enhanced by the warmth and beauty lent to the choral texture by the addition of harp and violin. The piece was commissioned by the Jubilate Choral of Waukesha, Wisconsin, in 2007.